Basecamp was released in 2004 as a simple project management software for small businesses and freelancers . Great usability and collaborative approach differentiated it from the existing complex project management apps. 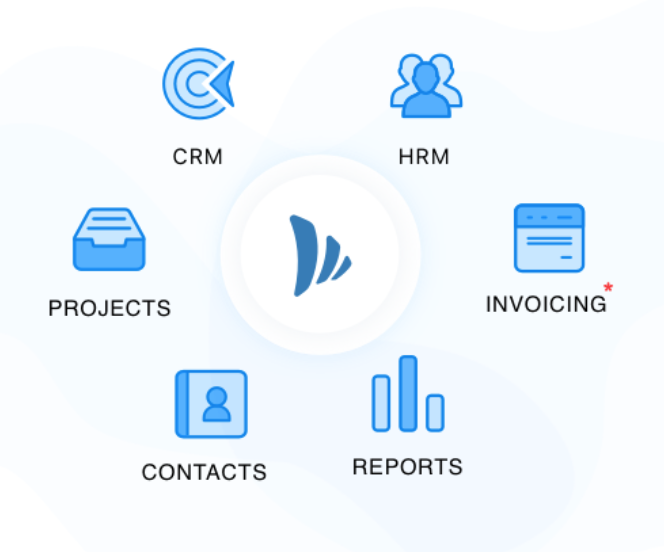 While Basecamp is a good project management tool, TeamWave is a complete platform to manage & streamline everything (including projects) in your company: Project Management, CRM & HR. Why TeamWave is the leading Basecamp alternative. Basecamp doesn’t offer CRM and HR management app. You’ll have to use Zapier to set up some form of integration and it’ll require additional subscription fee along with time. Basecamp’s pricing is $79/month if you need client collaboration. TeamWave has a straightforward pricing – $3/user per month. For annual subscription, the pricing is $2/user per month. Moreover all the plans get all the features (including collaboration) and apps – absolutely no restriction. Basecamp’s reporting features are limited and you need to go through multiple steps to find out relevant information. For example, if you want to see the work load of a team member you’ll have to click on ‘Reports’, search the team member and click on ‘Run a new report’. Note that there is no way to have a holistic view of all the team members, projects and time logs. – Which project is in a critical state with respect to overdue and total tasks? – Which project is contributing the most to the total number of overdue tasks across all the projects? – Which project has been continuously contributing more to the billable time log? – Which user has maximum work load? Who has the most number of overdue tasks? – Whether the time logged by team members has been consistently increasing or decreasing? You can also create custom reports related to time log by selecting billable/non-billable entry, organisations, users and projects. Basecamp’s key features are: task management, discussion, file sharing, milestone tracking, event scheduling and client/vendor collaboration. TeamWave offers you all these along with additional features like notes, time log, reports and tag management (tasks, files and projects). All the features are simple to use and time to get started with the project management app is about 5 minutes.